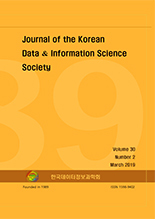 Yeonggyu Yun, Sangyeol Lee,(2019).Real estate VaR estimation in Seoul and Busan, Korea.한국데이터정보과학회지,30(2),469-478. In this study, we estimtate the value-at-risk (VaR) of the 10-day average apartment prices of Gangnam-gu, Seoul and Haeundae-gu, Busan in Korea. For this purpose, we adopt the semiparametric quantile regression approach for the VaR calculation based on ARIMA-GARCH models, employing the well-known risk measures such as the conditional autoregressive value-at-risk (CAViaR) and conditional autoregressive expectile (CARE) methods. After conducting the unconditional coverage (UC) and conditional coverage (CC) tests on the estimated VaRs, we conclude that the two methods perform similarly for the Seoul case but the CARE method shows more stability than the CAViaR method in the Busan case.